Classes I to VIII for all the Telangana State Govt., Zilla Parishad, Municipality, Private Aided & Unaided schools. TS TET 2017 Answer Key is released for both the Papers i.e., TS TET Paper - I (Morning Session) and TS TET Paper - II (Afternoon Session). The Board will prepare 4 different sets of Question Papers for TS TET 2017 Examination - Set - A, Set - B, Set - C, Set - D. It is up to the board which set to release and this would be finalized in the last moment just before the exam starts. There is also a chance to jumble and give all 4 sets to the candidates alternatively. Final Key is the key released by the TS TET Board after all the objections are cleared. 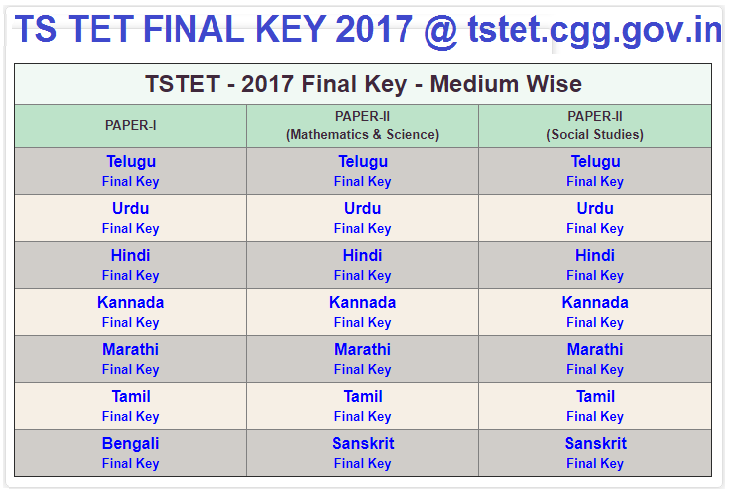 TS TET 2017 Final Key is released as per the schedule provided earlier. How ever the TS TET Results 2017 will be released on 05.08.2017. Tentative date for TS TET 2017 Final Key for Paper-1 and Paper-2 for various languages is released Now. Preliminary key is the key released by the board immediately after conducting the TS TET exam for the candidate's reference. Candidates can check their options answered in the exam by comparing the preliminary key. This TET 2017 Preliminary Key helps the students to evaluate their answers and also counter foil the answer key released by the Government. Those who have any objections in the TS TET 2017 Preliminary key can appeal to the board for re-checking the TS TET 2017 Key. The board has all rights to consider or not to consider the appeal. Based upon the appeals count and correctness of the mistakes raised in the appeal the board may consider and provide extra marks to the aspirants. Official date for TS TET 2017 Preliminary Key is 23-JULY-2017. released by Govt of Telangana. As we all know there will be 2 papers in TS TET Examination - Paper - I & Paper - II. Coming to the pattern of the examination both Paper - I & Paper - II will have only Multiple Choice Questions; there will be no theory based questions. One major advantage for candidates who appear for TS TET 2017 is that there will be no negative marking. This means if at all some of the questions the candidates answer are not correct also the marks will not be deducted. They can attempt all the questions though they are not confident of all the answers. Once the TE TET 2017 Key is released they can compare their answers with those given in the TET Key and analyze their marks or even rank. Let us see the detailed pattern of both the papers in TS TET 2017 Examination.